A mirror can update your interior. A mirror is a relatively inexpensive way to change an entire room and has lots of benefits especially if you have small rooms. This mirror has been used to decorate a plain dining room. A mirror, in the correct place, can give the illusion of space making small room feel bigger than they actually are. Hallways or landings are a great place for a mirror to stop them from feeling like a long corridor. 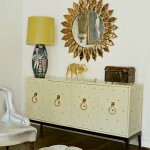 A mirror can also reflect natural light into dark areas of your room. Natural light is always a bonus and moving the mirror to different walls during the day will help you to find the best place to position it. 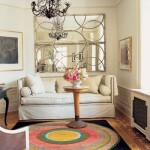 A large mirror also gives a room a focal point. The pictures above are from Elle Decor and show great example of how mirrors can transform a normal room into something special. Ballymena has many places which sell mirrors from B&Q to Creations on Mill Street or House Proud Furnishings which has just opened in Ballymena in the Montgomery’s building on Ballymoney Street.